Hotel in Bournemouth | Award Winning Hotel in Boscombe Spa with 2 RAC Hotel Stars and RAC 2 Dining Awards | Welcome to the Liston Hotel in the heart of Dorset. 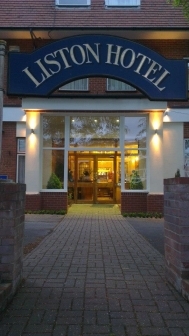 This family owned and run hotel in Bournemouth - the heart of Dorset, has offered its guests a personal, professional and friendly hotel experience for over 35 years. Our Hotel is set in a matured garden in the peaceful Boscombe Spa, only two minutes walk from Bournemouth's ornamental cliff top gardens and a few minutes walk from the safe and golden sands of the blue flag awarded beaches. During your stay with us, you will be away from the hustle and bustle but under two miles from Bournemouth town centre.
. Stag or Hen Parties or Similar groups. **CHECK IN FROM 2 PM - LAST CHECK IN 10 PM BY PREVIOUS ARRANGEMENT WITH US. Special Accommodation Offers are available from time to time, please phone for details on 01202 394588.